East vs. West: the contrast between the “dueling summits” this weekend was something for the history books. All hell broke loose at the G6+1, otherwise known as G7, in La Malbaie, Canada, while all focused on divine Eurasian integration at the Shanghai Cooperation Organization (SCO) in China’s Qingdao in Shandong, the home province of Confucius. US President Donald Trump was the predictable star of the show in Canada. He came late. He left early. He skipped a working breakfast. He disagreed with everybody. He issued a “free trade proclamation”, as in no barriers and tariffs whatsoever, everywhere, after imposing steel and aluminum tariffs on Europe and Canada. He proposed that Russia should be back at the G8 (Putin said he has other priorities). He signed the final communiqué and then he didn’t. The Euros were not pleased and forced Conte to abide by the official EU, as in German Chancellor Angela Merkel’s, policy: no G8 readmission to Russia as long as Moscow does not respect the Minsk agreements. In fact it is Ukraine that is not respecting the Minsk agreements; Trump and Conte are fully aligned on Russia. Merkel, in extremis, proposed a “shared evaluation mechanism”, lasting roughly two weeks, to try to defuse rising trade tensions. Yet the Trump administration does not seem to be interested. Heavy business, as usual, was in order. The Chinese partnered with Russian nuclear energy giant Rosatom to get advanced nuclear technologies and diversify nuclear power contracts beyond its current Western suppliers. That’s the “strategic” energy alliance component of the partnership. In a trilateral Russia-China-Mongolia meeting, they all vowed to go full steam ahead with the China-Mongolia-Russia Economic Corridor – one of the key planks of the New Silk Roads, known as the Belt and Road Initiative (BRI). Mongolia once again volunteered to become a transit hub for Russian gas to China, diversifying from Gazprom’s current direct pipelines from Blagoveshchensk, Vladivostok and Altai. According to Putin, the Eastern Route pipeline remains on schedule, as does the US$27 billion liquefied natural gas (LNG) plant in Yamal being financed by Russian and Chinese companies. On the Arctic, Putin and Xi went all the way for developing the Northern Sea Route, including crucial modernization of deep-water ports such as Murmansk and Arkhangelsk, and investment in infrastructure. The added geopolitical cachet is self-evident. Putin had said last week that annual trade between Moscow and Beijing will soon reach US$100 billion. Currently, it stands at US$86 billion. Now Russian businesses venture the possibility of reaching US$200 billion by 2020 as feasible. 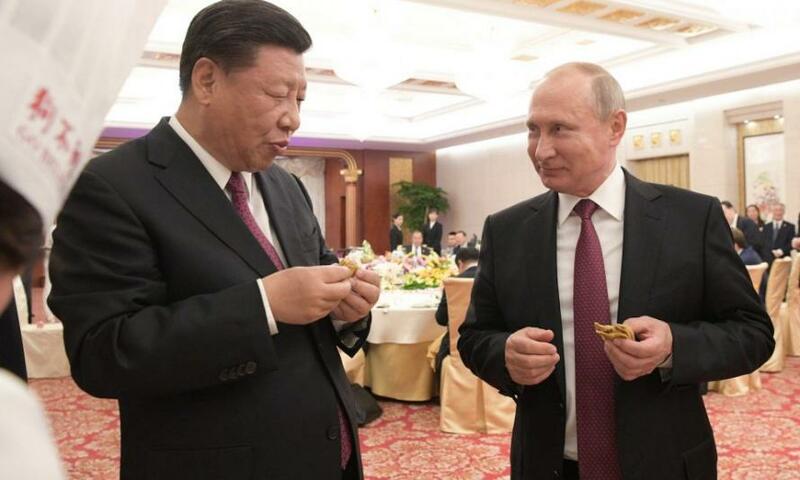 All this frenzy of activity is now openly described by Putin as the interconnectivity of BRI and the Russia-led Eurasia Economic Union (EAEU). Not to mention that the SCO itself interconnects with both BRI and the EAEU. Putin told Chinese TV channel CGTN that though the SCO began as a “low-profile organization” [back in 2001] that sought merely to “solve border issues” between China, Russia and former Soviet countries, it is now evolving into a much bigger global force. In parallel, according to Yu Jianlong, secretary general of the China Chamber of International Commerce, the SCO has now gathered extra collective strength to harness BRI expansion to increase business across Europe, the Middle East and Africa. So it’s no wonder companies from SCO nations are now being “encouraged” to use their own currencies to seal deals, bypassing the US dollar, as well as building e-commerce platforms, Alibaba-style. So far, Beijing has invested US$84 billion in other SCO members, mostly in energy, minerals, transportation (including, for instance, the China-Kyrgyzstan-Uzbekistan highway), construction and manufacturing. Putin also met with Iranian President Hassan Rouhani on the sidelines of the SCO and vowed in no uncertain terms to preserve the Iranian nuclear deal, known as the JCPOA. Iran, as an observer, fulfills the commitment. The spanner in the works happens to be tiny Tajikistan. Enter the trademark convoluted internal politics of the Central Asian stans, in this case revolving around Tajik president Emomali Rahmon accepting Saudi Arabia’s acquisition of a 51% stake in Tajikistan’s largest bank. Nobody else wanted it; Riyadh was just buying influence. All SCO full members must be approved unanimously. Still, that won’t prevent larger economic integration between Iran, Russia and China. The talk in the SCO corridors was that Chinese companies expect an extra bonanza in the Iranian market after the unilateral Trump pullout of the JCPOA. Behind closed doors, as diplomats told Asia Times, the SCO also discussed the crucial plan devised by the SCO-Afghanistan Contact Group, an Asia-wide peace process with Russia, China, India, Pakistan, Iran and Afghanistan trying to finally solve the decades-long tragedy without Western interference. So what about a G3? The “dueling summits” clearly set the scene. The G7 meeting at La Malbaie represented the dysfunctional old order, dilacerated by largely self-inflicted chaos and its apoplexy at the Rise of the East – from the integration of BRI, EAEU, SCO and BRICS, to the yuan-based gold-backed oil futures market. In contrast to the G7’s full spectrum dominance doctrine of total military superiority, Qingdao represented the new groove. Implacably derided by the old order as autocratic and filled with “democraships” bent on “aggression”, in fact it was a graphic illustration of multi-polarity at work, the intersection of four great civilizations, an Eurasian Café debating that another, non-War Party conducted future is possible. In parallel, diplomats in Brussels confirmed to Asia Times there are insistent rumbles about Trump possibly dreaming of a G3 composed of just US, Russia and China. Trump, after all, personally admires the leadership qualities of both Putin and Xi, while deriding the Kafkaesque EU bureaucratic maze and its weaklings, currently represented by the M3 (Merkel, Macron, May). In Europe, no one seems to be listening to informed advice, such as provided by Belgian economist Paul de Grauwe, who’s pleading for Frankfurt and Berlin to manage a common debt, without which the EU won’t survive the sovereign crises of individual members. Trump, for all his dizzying inconsistencies, seems to have understood that the G7 is a Walking Dead, and the heart of the action revolves around China, Russia and India, which not by accident form the hard node of BRICS. The problem is the US national security strategy, as well as the national defense strategy, advocate no less than Cold War 2.0 against both China and Russia all across Eurasia. All bets are off, however, on who blinks first.